What an amazing set of events we all witnessed yesterday. I watched the live broadcast of President Obama’s inauguration alongside high school students and other employees of the school where I work, all of us gathered around a large screen set up in the dining hall, the room constantly erupting into applause. I walked back to the office with my co-workers later, all of us elated and breathless. I’ve been thinking about how I will describe this moment in history to my future children and grandchildren, who will only know a world in which a black man can be President. I will tell them about election night, when across the country we danced in the streets. I will tell them about the doubts that existed during the campaign, how many times I heard people say that America will never elect a black man, or a man with the middle name Hussein, certainly not a black man named Barack Hussein Obama. But America did elect that man. I will tell them about the feeling among my generation, so jaded and so accustomed to not feeling represented– today we know what it feels like to have hope and faith. Some of us have already fallen back on the old jadedness (“His words are the same as Bush’s”, “He’s already letting us down”, “He’s just another politician”), but the rest of us are choosing to believe that this president is who he says he is, and we’re willing to give him the time to show us. I think when they ask about this moment, the images will speak best: the images from the campaign, from election night, and most of all the images from the inauguration ceremony. My favorite set of photos from yesterday is over at The Big Picture. Amid all the large historic moments and pageantry, another thing stood out to me, and I’m sure you noticed it too: the love between the President and the First Lady. We don’t often see that kind of genuine love between people in the public eye. These two don’t just love each other– they really like each other. When they got out of the limo during the parade and walked down Pennsylvania Ave, they never let go of each other. 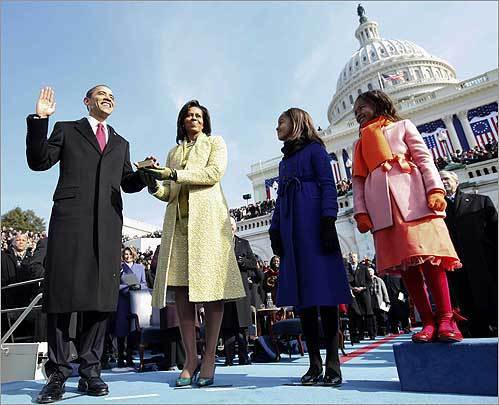 Michelle alternated which hand she waved with, and whichever one wasn’t waving was holding her husband’s hand. And then of course, did you see the way they danced together at the balls last night? Yesterday was refreshing and hopeful. I know we won’t all be getting ponies and 3-day work weeks, but I do think we’ve entered a new era of respect, accountability, and vision. Here’s hoping! RE: ChinaI love your pattern, so lovely and elegant.thanks for your comment,I totally agree with you, I love china.and i look forward to those dinner parties where i get to pull it out.p.s. love your blog.